Our mission is to stimulate and sustain the visual arts in Chicago. 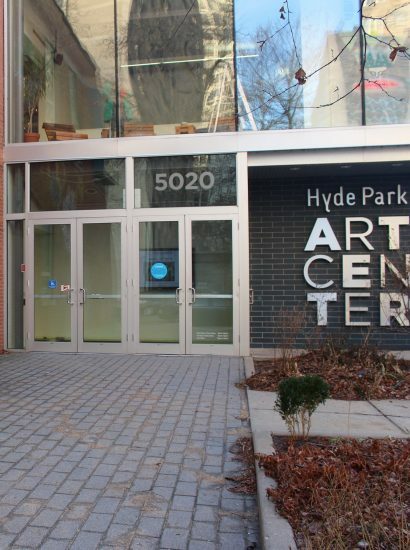 Hyde Park Art Center is a hub for contemporary arts in Chicago, serving as a gathering and production space for artists and the broader community to cultivate ideas, impact social change, and connect with new networks. The Art Center functions as an amplifier for today and tomorrow’s creative voices, providing the space to cultivate and create new work and connections. "It’s not just about art, it’s about connecting people to one another through art." We offer a comprehensive set of programs that serve the creative and resource needs of artists and our communities. Through our exhibitions, artist talks, studio art classes, international and local residency program, free public events, satellite class sites, and professional development opportunities we work to provide the space for artists at every age and stage to cultivate their practice, build connections, and impact our world. Bill Walker: Urban Griot. New Arts Examiner, 2018. Hyde Park Art Center Honors Masseys. Candid Candace Blog, 2017. Bill Walker, Dapper Bruce Lafitte and the Virtues of Angry Art. Chicago Reader, 2017. Cautionary Tales of City Life by Chicago Painter Bill Walker. Chicago Tonight WWTTW, 2017. Hyde Park Art Center Anchor Site for Chicago Architecture Biennial, Hyde Park Herald, 2017.